Video: Beatles Fan returns Billy J. Kramer’s sock after 50 years! Have you ever wondered what it was like to be a teenage girl during the very height of Beatlemania in the mid 1960s? Well, this video of author Dee Elias lets you know how far those girls would go to get close to their favorite stars! Watch as Dee finally gets to meet Billy J. Kramer at the 2014 Fest for Beatles Fans in L.A. 50 years after she stole his sock from his hotel room WHILE HE SLEPT! NOTE: Dee Elias was contacted by Mr. Kramer’s manager on Oct. 20th and threatened with legal action if she did not take down the above video from YouTube. She complied with (what I feel is their irrational) their request. If you’d like to know Dee’s story, please read her book. With the approach of the 50th Anniversary of the Beatles coming to the United States, it seems that new events, festivals and conferences are popping up everywhere to celebrate the occasion. And though the Fest for Beatles Fans is the biggest fest around, some of the others aren’t to shabby! The director of this event is Dr. Kenneth Womack, the Associate Dean for Academic Affairs at PSU Altoona, and the author of: Long and Winding Roads: The Evolving Artistry of the Beatles, The Cambridge Companion to the Beatles, Reading the Beatles: Cultural Studies, Literary Criticism, And the Fab Four and the soon to be released The Beatles Encyclopedia [2 volumes]: Everything Fab Four. Walter Everett – the author of the Beatles As Musicians book series, Mr. Everett is also a member of the School of Music faculty at the University of Michigan and the author of The Foundations of Rock. Jude Southerland Kessler – a Beatles expert, author and host of her own radio show, Ms. Kessler is the author of the John Lennon Series. She has spent nearly 30 years researching John Lennon and the Beatles for her 9 book series., making her a leading expert on the topic of the Fab Four. This is definitely set to be one of the most intellectual of all the Beatles events to be held in 2014! And what’s cool about their registration is that you not only can you sign up for which days you would like to attend, you can add your meals and accommodations to your package as you like! For more information on this conference, along with a schedule of events & presenters, and registration, check out their website: http://www.altoona.psu.edu/beatles. Damn! I got suckered by another musician telling me how “Beatle-y” their songs are and that I should listen to their album. This time, the request came from a musician/producer in Austin, TX named Andrea Perry and her album “Four“. Hi, I’m a Beatles freak with a new album with several very Beatles influenced songs. I’d love if you’d check it out. <snip> Tracks 4, 5, 13 and 14 are the most Beatle-y. Track 1 maybe too. Okay Andrea, I’ll be the judge of that! 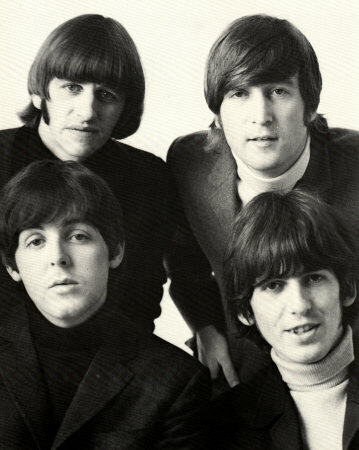 The violins and cellos on the first song ‘My Lover Said’ are what trigger the Beatles-effect right from the get go and this song sets the tone for the album and I think it’s a more Beatles-esques song than – ‘Back Before There Was You’ or ‘While Spinning’. Now, how does this album stand on its own away from it’s Fab Four fan influence? Not bad…but there was a song or two where I would have liked to have heard more layered vocals or harmonies because the lyrics seemed to become background noise to the instrumentals. And though Andrea says that track 5 – ‘While Spinning’ is Beatle-y, it sounds a lot like track 6 – ‘Where Have You Been’. There was also a part of me waiting for this album to climax and I didn’t feel like it quite did that until about track 13 -‘Welcome Home’. But don’t take my word for it, head over to Andrea Perry‘s website and listen to it for free. If you like what you hear, the album is only $7 to download! I’m not going to rate this album because I just don’t think it would be fair. Yes…heavy Beatles influence. Yes…the album can stand alone, but has it’s issues. How would you rate it? It’s been way too long since I’ve posted a review or opinion on this blog, but when I heard about Beatles At The Ridge, I knew I just had to spread the good word! Beatles At The Ridge is a two day festival in Walnut Ridge, Arkansas created by Charles Snapp in 2011. It is now in its third year running. Last year, the crowd size was estimated at over 10,000, but I have a feeling that this fest is going to put the best of all Beatles festivals on guard! This fest has the potential to become a new mecca for the most diehard fans. So what connection does Walnut Ridge have to the Beatles? I’m glad you asked…because Walnut Ridge can boast about their Beatles encounter. From their website: “A quiet night in 1964 was interrupted by the unusual sound of an airliner approaching Walnut Ridge Airport. Its arrival sparked enough interest that three local teens went to investigate, only to discover John, Paul, Ringo, and George walking from the plane. The Beatles, the biggest rock band in the world, had arrived at Walnut Ridge, Arkansas.” You can read the rest of the story and see pictures here. This year’s fest will have over 100 vendors (the number is still growing as word gets out about BATR). Admission is free, parking is free and all entertainment is free. I don’t think I’ve heard of another Beatles festival that can say that (but I could be wrong). The entertainment for this two day, three stage event is also growing by the day. Scheduled to appear this year are: Stan Perkins (son of Carl Perkins), Beatles tribute band – BritBeat, Ringo Starr tribute artist – Ringer Star, Beatles expert & author – Jude Southerland Kessler, Danny Donuts Yellow Submarine Parade and many more! There will also be a Beatles costume contest with prizes! A full list of events can be found here. In 2012, Beatles at the Ridge won the “Top new Festival” award from the Arkansas Festival and Events Association. Beatles At The Ridge will run from Friday, September 20th thru Saturday, September 21st. For more information, go to: www.BeatlesAtTheRidge.com. I have a feeling this party is truly going to rock and it’s going to put a scare into the owner of many a Beatles fest. If you go, please check in here and let us know your opinion! Two new holiday songs for your listening pleasure! The first is ‘Honey Badger Christmas’ by Cliff Hillis. Cliff is a huge Beatles fan and is known to cover a song or two in his shows. The second song is VERY Beatlesque! It’s ‘Imagine Christmas’ by Alan Bernhoft, the man behind all the Beatlesque CDs. Enjoy! And have a safe and happy holiday season!